If you believe that breakfast is the most important meal of the day then you should give this dish a try. This crop has become highly appreciated for its nutritional value, as its protein content is very high (18%). Unlike wheat or rice (which are low in lysine), and like oats, quinoa contains a balanced set of essential amino acids for humans, making it a complete protein source. It is a good source of dietary fiber and phosphorus and is high in magnesium and iron. Quinoa is gluten-free and considered easy to digest. It is also easy to make and very versatile. I use quinoa to make burgers, Nachos, Tacos, faux sausage, etc. My husband likes to take it to the office for breakfast. Heat cooked quinoa in a small pan with a little plant milk or heat in microwave. Add fresh or dried fruit and any other toppings you like. This is a really easy breakfast or snack. If you’re on the go it can be kept warm in a thermos or eaten cold (we like it warm). My husband likes his with raisins, cinnamon and a touch of agave. I like mine with fresh bananas, dried cranberries and raw pumpkin seeds. Today I used fresh strawberries because they were available. This can be made in advance and enjoyed all week. My 1 year old devours this. The only problem is he is not very hand with a spoon yet so I have to assist him. 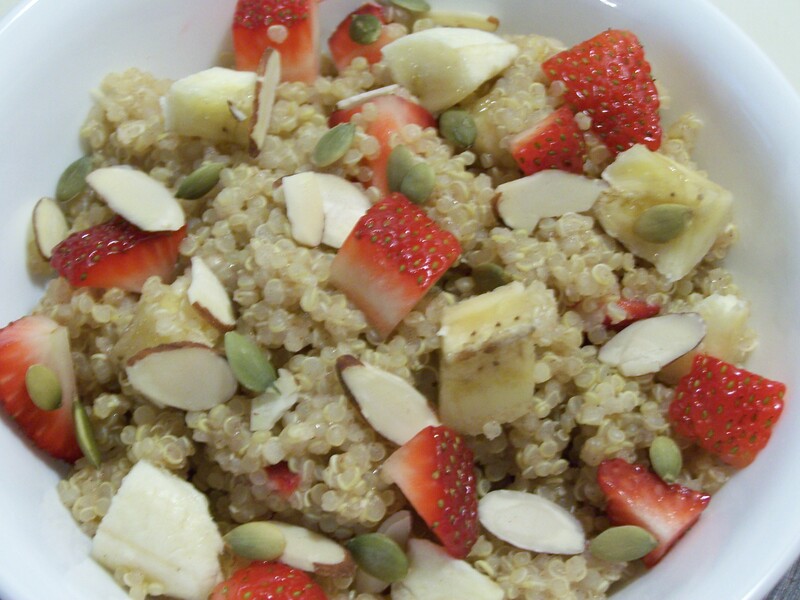 Do you eat quinoa for breakfast? If so, how do you eat it? I love quinoa, but never had it for breakfast (other than maybe having leftovers from the night before). But this ‘quinoa breakfast’ theme is keep popping up in blogs, so it got me curious. When I was growing up, I could barely stomach breakfast. Now it’s my favorite (and biggest!) meal of the day. We usually have a mix of grains, but every once in a while have quinoa. Thanks for the reminder! That’s just beautiful…and sounds truly delish. I love, love, love quinoa…OK, I really love food……….and since quinoa is food…I really love it!!! Thanks for the idea!! Thank you Connie, it’s my pleasure! I love quinoa too and plan to cook more tomorrow, for dinner this time. I’ve only recently discovered quinoa (and all of its benefits). In fact, I used it for the very first time just last week (quinoa sushi – highly recommended, btw). I’ll definitely be trying this out. Thanks for sharing! I’m glad you discovered quinoa! I love it! We’ve been eating Taco Quinoa for the last few days. I love how versatile it is. I cook quinoa with half portion steel oats or old fashion oatmeal in water. I mix in flaxseed and cinnamon. I top with mangos, strawberries or mixed fruit…whatever I have on hand from a wholesale club. The fruit is sweet enough for me so no need to add Agave. That sounds delicious Cindy. I’ve moved away from agave but sometimes the fruit I buy is too tart and needs a little something. Now my sweetener of choice is maple syrup or date paste. I’ll have to try mixing oats with the quinoa. I usually use leftover quinoa but I bet the oats would make it much creamier. That is a great question. There a lot of people who are anti-agave. I’m not one of them but I got a little burned out after using it in my coffee daily for years. I switched to maple syrup for the most part for about a year then moved away from that. I am comfortable using either, I just try not to go overboard.